Not your everyday bouncer!! 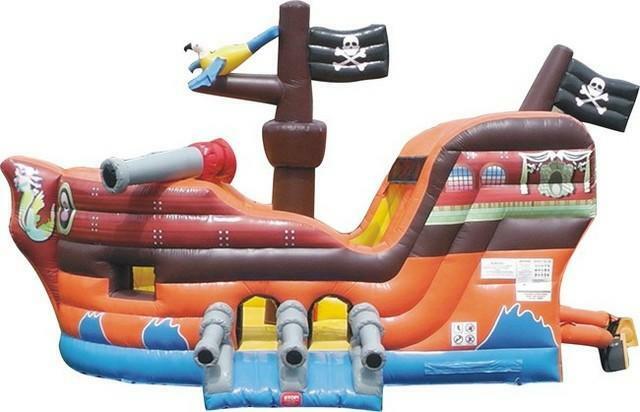 Our awesome Pirate themed inflatable combo features the look of a Pirate Ship on the high seas. Climb on board, Make your way up the wall to the top of the ship, Take a fast ride down the slide to the bouncing deck. Once you are on the deck of this amazing inflatable Pirate Ship, you can jump and bounce all day long or head back up to the top to do it all over again. Designed as a combination slide, climb and jump, the inflatable Pirate Ship is a true favorite for children of all ages at any pirate themed party or event. It's a combo with climb, slide and jumper all in one. Everybody say AAARRRGGGHHH!